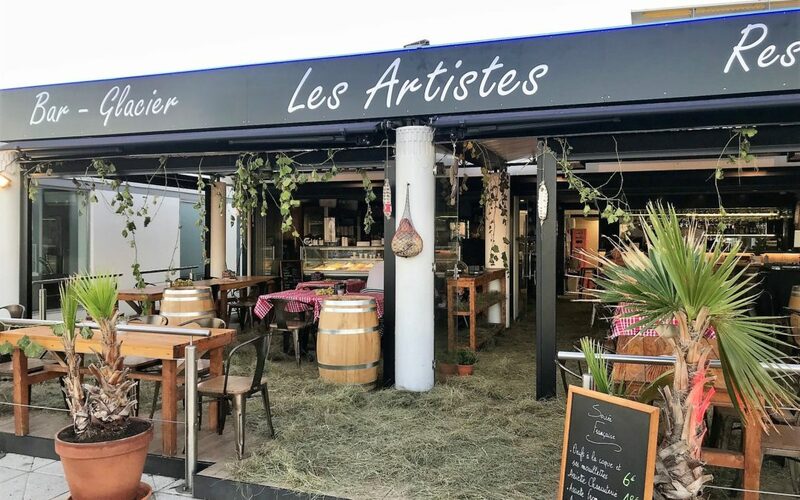 Located in the north quay, the restaurant “Les Artists” has changed hands recently and is already planning a makeover for the autumn. Jean-Christophe Versace and Julien Parente are in command of the place. These two childhood friends made their professional experience without going off the radar. Jean – Christophe was first a sports coach in the family sports hall before managing a beach restaurant in Juan Les Pins. This was before the coastal law compel restaurants to become precarious and demountable. Julien entirely dedicated the first part of his professional life to sport and especially tennis, in Antibes. Then came the “change of life” that pushes to explore new horizons and to do others things. Leaving the courts was a decision Julien did not take lightly, and that he does not regret today. For his part, Jean-Christophe went naturally from the beach to the Port Camille Rayon, as he welcomed up to 1200 customers during festive evenings in the beach of Juan les Pins. And his desire to go back to the catering sector came back quickly. Julien follows with enthusiasm the wake of the experienced entrepreneur. The two friends combined their sense of hospitality and know-how and looked for a place for the new challenging project they have launched. An ad on the site “le bon coin” offered the rental of a commercial space on the port Camille Rayon! So they booked an appointment with the owner. “We were looking for a restaurant well placed and big enough to organise events” they say. And it worked right away. “Here, we have everything we need and we get along well with the other “actors” of the port and the restaurants next door”. Once the administrative procedures completed, some changes needed to be done in the restaurant and they had to find a Chef in order to open the 30th of June. The network of contacts of J.C and Julien acted then to build a reliable and competent team able to attract customers in the absence of a real “communication plan” they had to leave aside. A big spring clean-up and a couple of new tables and they started the first summer season. The adventure of the two “Artists” begins quite well and allows them to think bigger. In a few weeks, the new co-managers will start a total makeover of the kitchen. The reopening of the restaurant “les Artistes”, just before the Christmas holiday, will mark the beginning of the theme parties with the house cocktails, appetisers and lounge music in the background.